There is no denying that Marvel have been dominating the film industry of late and with all the future movies mapped out for the next few years it shows no sign whatsoever of slowing down anytime soon. But Marvel have not stopped at just the movies, the also moved onto the small screen with shows like Agents of S.H.I.E.L.D. and Daredevil. Since it started, Agents was a rollercoaster ride, losing hype, recapturing it and losing it again. And for a while, it looked like Agent Carter would go the same way when it was broadcast on American television but it really picked up when it hit UK screens last year. But Agent Carter manages to be both a tremendous amount of fun and full of tension. Its dark and gritty enough to keep you gripped but it was full of fun and a great sense of humour that both Daredevil and S.H.I.E.L.D. lacked. In no way is it as 'bloated' as S.H.I.E.L.D. and the first episode is aided greatly by the fact that there are only a few characters that need to be introduced. The episode begins with a flashback sequence from the end of the first Captain America movie then it shoots of to New York in 1946 where we find Peggy having gone from a hero of WW2 to being treated like nothing more than a tea lady by the predominantly male SSR, the top secret department that would one day become S.H.I.E.L.D. But then Peggy is contacted by her old friend Howard Stark, who tells her about a theft were all his inventions have been stolen and have turned up on the black market. He quickly becomes enemy no 1. What follows is an exciting, tense and dangerous adventure as Peggy wears disguises, throws men out of windows and defuses bombs. Its a great journey that's first and foremost a cracking story that isn't invested on creating a universe. For people complaining about the lack of female lead movies here is a woman who is as deadly as her foes and just as smart as Banner or Stark. 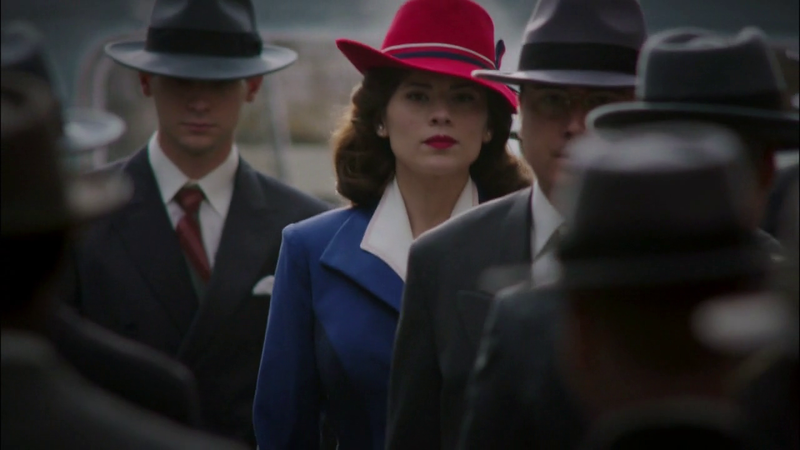 Haley Atwell is so fantastic in the role of Peggy Carter, she instantly becomes the character, so much so that no one could ever play her again. Atwell once called the show and 'action packed adventure'. And she sure as hell wasn't wrong!